Each Wednesday kids attending the small elementary school in Wawona load a bus and head to Badger Pass, the local ski hill inside Yosemite, for a winter sports day. As with swimming lessons in the summer, Camp Wawona staff volunteered to teach ski and snowboard lessons and help out wherever needed. 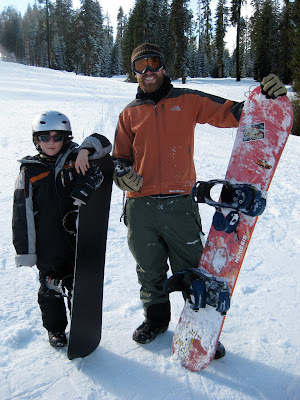 So far, Ryan Kloosterhuis has taught all the snowboard lessons while Jerrod Gabel and Donnie Keele split the beginner skiing lessons over two Wednesdays. Earlier this year camp staff attended the Mountain Area Ski School training program which gave them valuable training and helpful tips on teaching winter sports. Camp Wawona staff look forward to each Wednesday as well as any other opportunities to serve the local community. Pictures of the last ski day are below. Badger Pass Ski Area in Yosemite National Park. Students gather for their winter sports day. Ryan Kloosterhuis teaches Garret the tricks of the trade. Donnie Keele observes Garret's awesomeness. Ryan and Garret at the end of the day. Jon and Donnie with their young ski pupil, Jade.